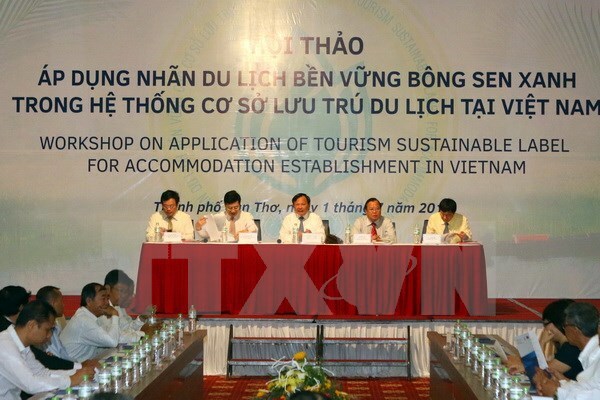 Within the framework of the Mekong delta green tourism week in 2015, in the morning on July 1st, in Cantho city, Vietnam Tourism administration organized the workshop on application of sustainable tourism trademark of green lotus to the residence system with the aim to boost tourism development in sustainable orientation, especially for residence units nation- wide. The application has been outlined since April 2012. After 3 years of test executing, 33 hotels across the nation have been presented certificates of sustainable tourism trademark of green lotus at from levels 1 to 5, mainly in Ho Chi Minh city, Ha Noi, Thua Thien Hue, Quang Nam, Da Nẵng, Khanh Hoa, Binh Thuan, Ba Ria- Vung Tau and Bac Ninh. There are over 1,500 units of this kind in Mekong delta region with around 30,000 rooms, doubling against 2008. This is one of advantages for Mekong delta tourism to enhance competitiveness, raise professional level. However, with strong development of residence units across the nation in general and regional provinces, cities in particular, the tourism sector is facing big challenges on environmental aspect. In face with this reality, state management offices and units doing business in tourism must strictly carry out environmental assurance in sustainable development.